A U.A.E. national, born on September 1, 1958, Advocate and Legal Adviser and Member of the Emirates Bar Association, the International Bar Association and the Abu Dhabi Arbitration and Conciliation Committee and the International Advisory Board for the Center of Business Law & International Trade (Dubai Chamber of Commerce) and practices in the areas of construction, commercial law, construction and maritime claims and dispute management and alternative dispute resolution. Arbitration cases have included comprehensive construction, environmental, and commercial disputes involving public and private sector parties. Issues in dispute have included contract interpretation and performance, regulatory and enforcement actions, professional malpractice, agency representation agreements, vendor and equipment supply, insurance, and warranty coverage. Experience as an arbitrator in cases ranging from multi-party construction and environmental disputes to commercial, residential, and public construction arbitrations. Served as an arbitrator in substantial arbitration proceedings involving performance issues, design and construction defects, schedule delay and acceleration, cost overruns, financing disputes, differing site conditions, and constructive changes. Listed as an expert in Commercial Arbitration in Dubai Chambers of Commerce Directory, The Legal 500 Martindale Hubbell in Commercial Arbitration. Attorney in private practice emphasizing complex construction disputes and ADR. Involved in preparing and pleading in numerous Civil Engineering related cases, providing project management; construction claims; expert testimony, litigation support, and related services in connection with assertion, defense, and resolution of construction and environmental claims and disputes. Practicing in all areas of the Law since 1981 and specializing in Commercial, International and Private Law in 1990; holding at the moment a port-folio of above 1,000 private and corporate clients and handling sophisticated multi-parties cases and disputes and has extensive experience both as prosecutor and defense counselors and is able to represent clients at all stages of litigation and in virtually every field of legal practice. Founded the Law Firm, Al Sharif Advocates & Legal Consultants in 1982, in Dubai. 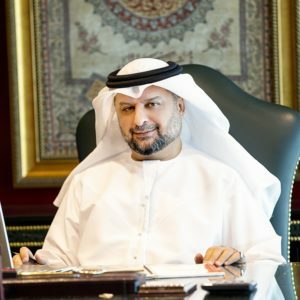 Presently, the firm comprises of a team of fourteen lawyers experienced in different international jurisdictions, and is considered one of the leading law firms in the United Arab Emirates. More than 140 appointments as a party-appointed arbitrator. Disputes involving tanker and dry cargo time and voyage charter parties and bills of lading, ship damage and groundings, unseaworthiness, dry and liquid cargo contamination, regulatory compliance, ship repair, ship finance and container conference service agreements. Prepared several legal opinions and articles upon Khaleej Newspaper request that was published in the said leading daily publication. Imparted Lectures and Seminars for several institutions including the Dubai Chamber of Commerce and the Dubai Indian Committees, on various legal topics including Company Law.